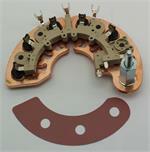 Heavy duty bridge rectifier for Delco AD230, AD237, and AD244 series alternators. This is the earlier design, but has a screw-down collar for dual use. Featuring a 6mm battery post and 50 amp press-fit avalanche diodes.